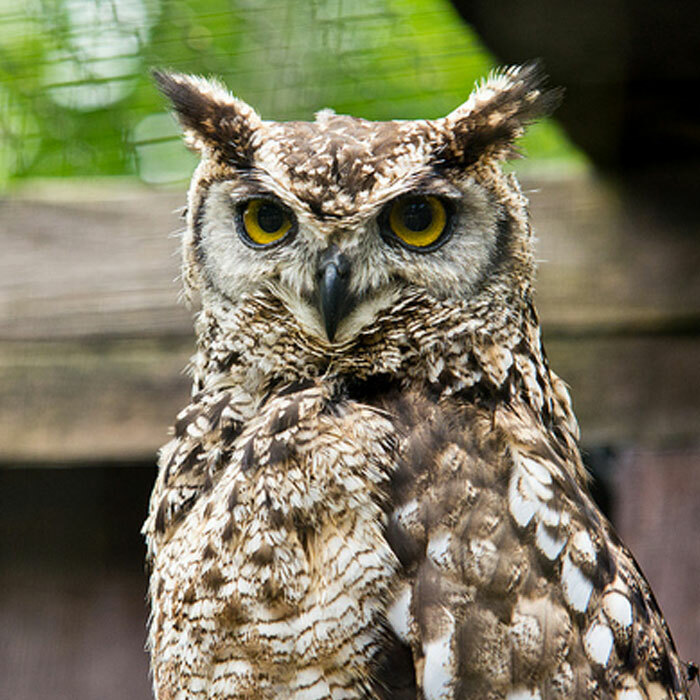 Owls are Birds of Prey, which means that they must kill other animals to survive. Their diet includes invertebrates (such as insects, spiders, earthworms, snails and crabs), fish, reptiles, amphibians, birds and small mammals. 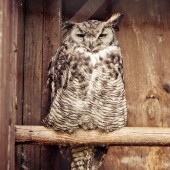 The main food largely depends on the species of Owl. For example, Scops and Screech Owls feed on insects mostly, while Barn Owls eat mainly mice, shrews and voles. 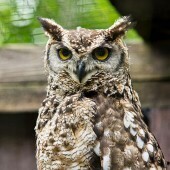 Larger Owls such as the Eagle Owl will prey upon hares, young foxes and birds up to the size of ducks and gamebirds. 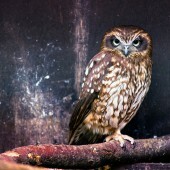 Some species have specialised in fishing, such as the Asian Fish Owls (Ketupa) and African Fishing Owls (Scotopelia). 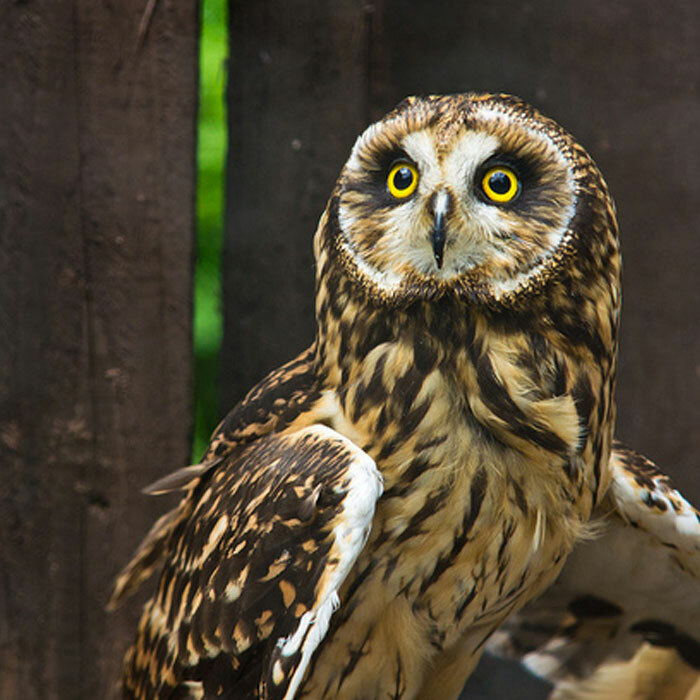 Although certain species have these preferences for food type, most owls are opportunistic, and will take whatever prey is available in the area. 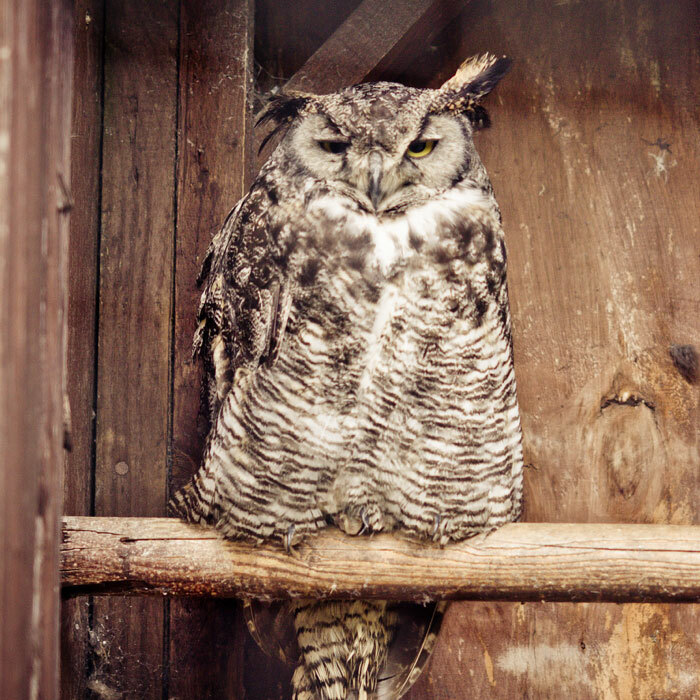 Owls generally have a hunting territory away from their daytime roost. All Owls are equipped with special adaptations that make them efficient predators. Keen eyesight allows them locate quarry even on dim nights. Sensitive, directional hearing helps locate concealed prey. Some species can even hunt in complete darkness using sound alone to guide them to a successful kill. An Owl’s flight is silenced by special wing feathers, that muffle the sound of the air rushing over the surface of the wing. This allows an Owl to hunt by stealth, taking their victims by surprise. It also allows the Owl to listen for prey movements while still flying. Most species hunt from a perch, such as a low branch, stump or fence post. They will wait for prey to appear, and swoop down with open wings, and their talons stretched forward. Some species will fly or glide a little way from the perch before dropping on the victim. In some cases, the Owl may simply drop on the target, opening their wings at the last moment. Other species prefer to soar, or make quartering flights, scanning the ground below for a suitable meal. When a target is located, the Owl will fly towards it, keeping its head in line with it until the last moment. This is when the Owl pulls its head back, and thrusts its feet forward with the talons spread wide – two pointing backwards and two forwards. The force of the impact is usually enough to stun the prey, which is then dispatched with a snap of the beak. 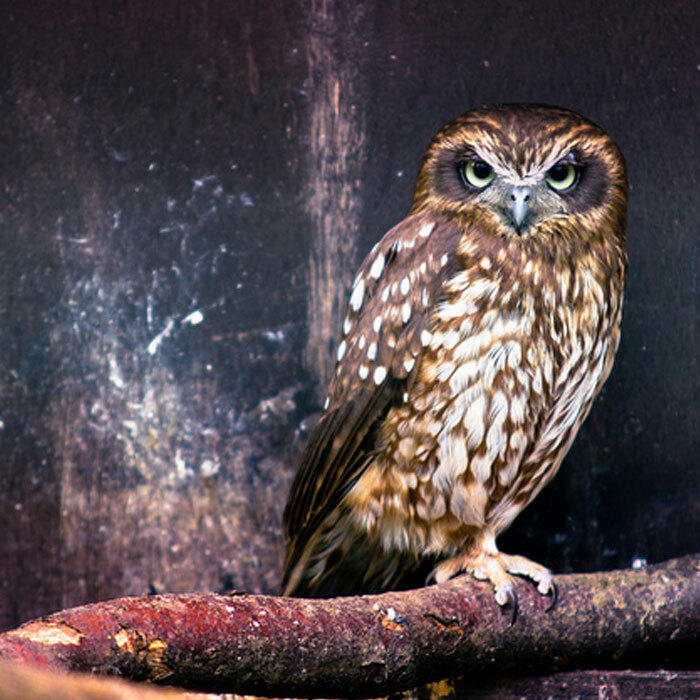 Owls can adapt their hunting techniques depending on the type of prey. Insects and small birds may be snatched in mid air, sometimes after being flushed from the cover of trees or bushes by the Owl. Owls that catch fish may skim over water, snatching fish on the fly (Pel’s Fishing Owl) or, the may perch at the water’s edge, grabbing any fish or crayfish that surfaces nearby (Blakiston’s Fish Owl). Other species may wade into the water to chase fish, water snakes, crayfish or frogs. Once caught, smaller prey is carried away in the bill, or eaten immediately. 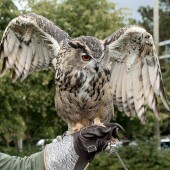 Larger prey is carried off in the talons. In times of plenty, Owls may store surplus food in a cache. This may be in the nest, or tree hole, or a fork in a branch. Like other birds, Owls cannot chew their food – small prey items are swallowed whole, while larger prey are torn into smaller pieces before being swallowed. 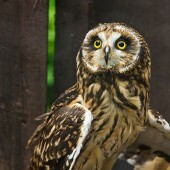 Some Owl species will partially pluck bird and larger mammal prey. The second part is the muscular stomach, or gizzard. There are no digestive glands in the gizzard, and in birds of prey, it serves as a filter, holding back insoluble items such as bones, fur, teeth and feathers (more about this below). The soluble, or soft parts of the food are ground by muscular contractions, and allowed to pass through to the rest of the digestive system, which includes the small and large intestine. The liver and pancreas secrete digestive enzymes into the small intestine where the food is absorbed into body. At the end of the digestive tract (after the large intestine) is the cloaca, a holding area for wastes and products from the digestive and urinary systems. The cloaca opens to the outside by means of the vent. It is interesting to note that birds (apart from the Ostrich) do not have a bladder. The excretion from the vent is largely made up of an acid which is the white part of a healthy dropping. Several hours after eating, the indigestible parts (fur, bones, teeth & feathers that are still in the gizzard) are compressed into a pellet the same shape as the gizzard. This pellet travels up from the gizzard back to the proventriculus. It will remain there for up to 10 hours before being regurgitated. Because the stored pellet partially blocks the Owl’s digestive system, new prey cannot be swallowed until the pellet is ejected. Regurgitation often signifies that an Owl is ready to eat again. When the Owl eats more than one prey item within several hours, the various remains are consolidated into one pellet. The pellet cycle is regular, regurgitating the remains when the digestive system has finished extracting the nutrition from the food. This is often done at a favourite roost. 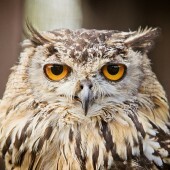 When an Owl is about to produce a pellet, it will take on a pained expression – the eyes are closed, the facial disc narrow, and the bird will be reluctant to fly. At the moment of expulsion, the neck is stretched up and forward, the beak is opened, and the pellet simply drops out without any retching or spitting movements. Owl pellets differ from other birds of prey in that they contain a greater proportion of food residue. 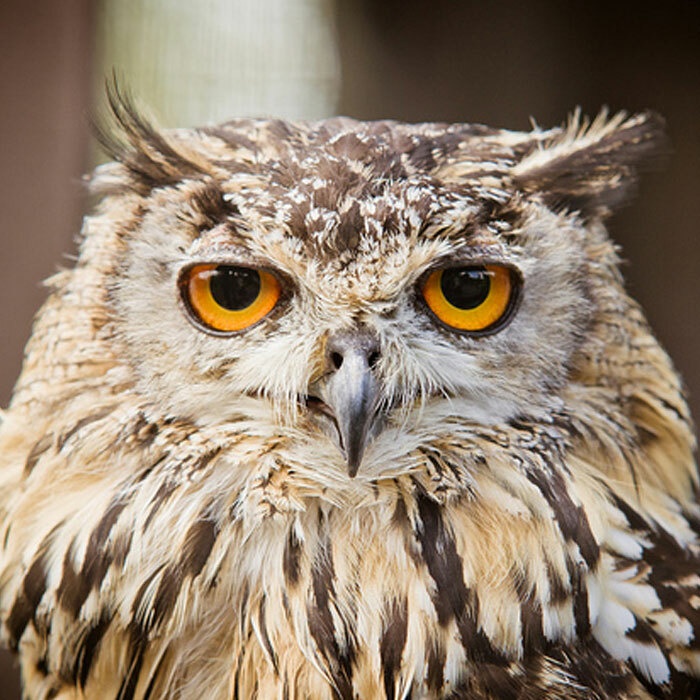 This is because an Owl’s digestive juices are less acidic than in other birds of prey. Also, other raptors tend to pluck their prey to a much larger extent than Owls.